This is a general overview just to give you some idea of what T.C.M is about. TCM is two thousand to three thousand years old. The TCM method is essentially different from Western medicine. 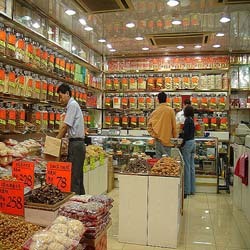 TCM is a major part of the healthcare system in China. It still forms a major part of healthcare provision in China, and is available in state hospitals together with western medicine. As I have said previously, giving the patient choices is something I wholeheartedly agree with. Much like Ayurvedic medicine, TCM is founded on the concept that the body is a little universe. The way the illnesses are treated is based on what the diagnosis is. The differences of the syndromes are also important. Zang-fu organs are the hub of a person's body. The organs and tissues are connected throughout a system of channels (Called meridians) as well as blood vessels within the human body. The Chi or Qi means breath it acts as a carrier of information, which is expressed through the meridian system. Zang-fu organ dysfunction might be replicated on the skin through the system. The skin diseases may also influence their associated fu or zang organs. Distressed fu or zang organs can also influence one another through interior connections. The treatment begins with the examination of your whole system, and then centers on the modification of pathological changes by readjusting the tasks of your zang-fu organs. Evaluating the syndrome does not only include the nature, mechanism, cause, and location of the disease, it also includes the conflict between body resistance and viruses. In addition, treatment is founded only on the differences of syndromes. What this means is that those with the same disease may well be treated in dissimilar ways. However, different diseases might result in the identical syndrome, so are taken care of in similar ways. The treatment and clinical diagnose in Traditional Chinese Medicine is largely based on the five elements and yin and yang theories. The characteristic Traditional Chinese Medicine therapies include herbal medicine, acupuncture, and qigong exercises. Acupuncture treatment is done by stimulating particular areas on the outside of the body. Herbal medicine operates on your zang-fu organs on the inside. Qigong attempts to restore the arranged information flow internally through Qi. These therapies may appear especially different in their approach but they share the same fundamental sets of assumptions as well as insights in the character of the body and its position within the universe.